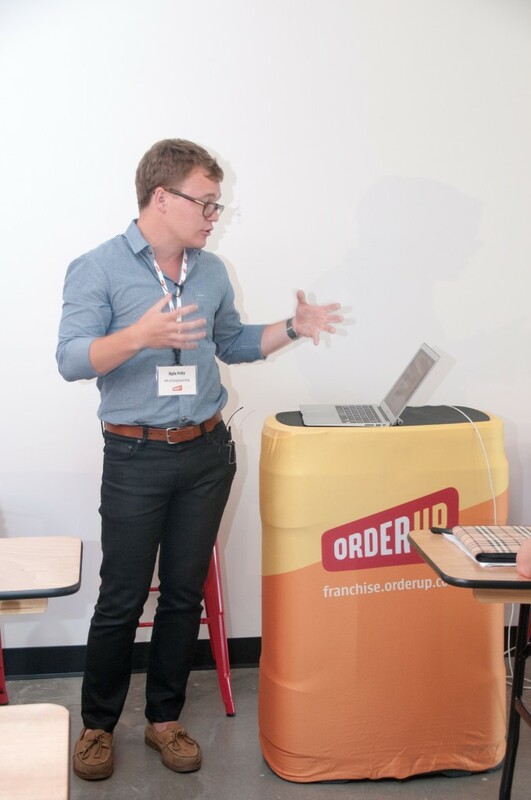 Kyle Fritz is now VP of Engineering for the Baltimore-based company, OrderUp—a digital franchising firm that specializes in mainstreaming the online food ordering process. This past August, venture capital firm Revolution Ventures, along with LivingSocial’s cofounder Tim O’Shaughnessy, managed a Series A round of funding for OrderUp to the tune of $7 million. Kyle’s been an integral member of the company since its early days, starting out as their key software developer. Undoubtedly, as the company has grown, so has his workload. But, true to his reputation as an all-around nice guy—someone who’s eager to help and educate, Kyle graciously took some time over Thanksgiving break to answer my questions. When asked in a former interview about what you like to do for fun, you replied “work.” Is this still accurate? If so, what part of your job do you consider “play”? Haha. That’s only kind of what I meant. Work is really fun for me: I work with really talented and exciting people. We joke around constantly while we’re building a really amazing product at OrderUp. When we’re having a meeting, we’re also throwing a ball around or goofing off with meme videos and gifs. Two parts of my job are my favorite: 1) prototyping a new product and 2) pairing up with another engineer to push through a particularly challenging part of a project or feature. These are both super fun. In the case of prototyping a new product, it’s super exciting to start with a blank screen and make something that wasn’t there before. What’s the very first thing we’re going to make? Where do we put it and how do we connect it to the next thing? Then it’s, “Let’s grab a beer from the fridge and start the third thing.” Super fun. If I can finish a prototype in a single session, I’m super excited and will be talking about it all night. Paul Barry and I prototyped the technology for OrderUp’s delivery technology just like that. Pairing up with another engineer is a different kind of fun. There the excitement comes from getting to know the person and how they think. We have so many new people at OrderUp now. We added 10 engineers in the last quarter to our team. And every one of them was someone that I was personally really excited about working with. So when I get the chance to sit next to someone and hash something out, it’s a lot of fun. Lots of “Oh, that’s an interesting way to think about it” conversations. Tech and coding are two different things, in my mind. When I interview someone, I want them to understand tech. I always ask, “What are some [consumer] products that you love? And why do you like them?” I want them to recognize that all the apps on their phone are products made by people to solve specific problems. And to think about what happens behind the scenes to make that happen. This is especially true for sharing economy companies like Uber, Airbnb, and OrderUp. That’s understanding tech. Programming is a different thing. It’s just a skill. I wouldn’t go so far as to say anyone can learn it, but definitely most people can. It just takes a lot of time. I wouldn’t pick up a violin and expect to be any good at it in a week or a month. It takes years. Programming is the same. The more examples you see from projects you’re working on, the more intuition and knowledge you build up. Taking a class doesn’t make you a programmer, loving to make things with a computer makes you a programmer. Taking a class can help (I teach a class like that at Betamore). But someone who’s going to be really good is so excited that when they come home from work or class, they pop open their computer and get back after it. Because they’re curious; because they want to make things. A person wanting to learn how to program also needs a reason. Hopefully that reason is an idea they want to make a reality. I read recently that the startup realm can be quite an ageist atmosphere. You are young, which is generally more acceptable than, say, being middle-aged and just starting the game. How do you think this can be changed? Being middle-aged and “just starting” any “game” is going to be tough. Showing up for your first day of law school at forty-five years old is going to be weird too. I think the “ageist” part of startup culture can come from the fact that in a startup, you’re going to spend a ton of time with the people you work with. And doing that is going to be a lot more enjoyable if those people are your friends. That way, when you’re working together at 6:45 pm on Tuesday night, you’re also having fun and socializing. A lot of people starting companies are young, so they pick friend/co-workers that are the same as them, young. Young people haveless to lose. So in some ways that makes it easier to start something from scratch. There’s less money for salaries and comp. in a startup compared to an established company. And this is going to be more palatable to a young person without any responsibilities than someone middle-aged who has people depending on them. How do we change this? I’m not sure if we can. The number one rule of starting a new company is that you can’t already have a job. The vast majority of us can’t do two things at once. So to start something new, you’re going to have to quit your current job. And that’s a big risk to take if you have people depending on you. There must be something other than “working” that you like to do for fun. Do you enjoy sports? Oh I do a lot of things besides work for fun! I love being active and outdoors. I have two cool bikes (a fixie and a cross-bike) and love going to Bike Party. I love camping and rock climbing. I have super great friends that I can count on to make every weekend really fun. I also have a garden and make my own cider and beer. I really like staying in town in Baltimore on the weekends because there are so many events and openings and parties to go to each weekend. I love when people come to visit me and I get to show them the city I love. The most exciting part of programming, for me, is using it make things happen in the real (away from keyboard) world. That’s because I love this world. How did you go from OrderUp’s conception to actualization. It seems that it’s during this process that most hopeful entrepreneurs get lost. Do you have any advice to offer? Chris and Jason started OrderUp in 2009 to build on the industry experience they had in a previous venture. I joined in 2011. It was a very different company back then but there was definitely a common thread: we wanted to make something big. Chris has incredible market intuition. He set the vision early on and together, with a lot of help of from an expanding team, we brought it to fruition. The best ideas always bubble up at OrderUp. That’s a credit to the team we have there. My best advice is this: build a team of people you love working with to solve a problem with a demonstrated market need. This might sound a little generic but the key things to think about are team, problem and market. An entrepreneur should be thinking about those words every day.